[Chicago] – Today, partners came together to ensure kids across America can experience our national parks and public lands. The National Park Trust, The North Face, and the Outdoors Alliance for Kids joined the National Park Service to co-host an Every Kid in a Park event at the Indiana Dunes National Lakeshore for 60 fourth graders from the Chicago Academy. This is the fourth event in a special Every Kid in a Park event series hosted in five different cities (NYC, D.C, San Francisco, Chicago, and Boston), all funded by The North Face Explore Fund. “We were delighted to work with The North Face and the Outdoors Alliance for Kids to connect local Chicago 4th graders to the Indiana Dunes National Lakeshore. They experienced a fun-filled day learning about local wildlife, history and outdoor recreation — and the importance of enjoying and preserving these special places,” stated Grace Lee, Executive Director, National Park Trust. “Turning kids onto National Parks and public lands via the Every Kid in a Park Program charts a course for a lifetime of adventure. I can think of no better gift to our children,” said Paul Labovitz, Indiana Dunes National Lakeshore superintendent. About National Park Trust: National Park Trust, a 501(c)(3) non profit, is dedicated to preserving parks today and creating park stewards for tomorrow. Since 1983, NPT has completed more than 100 land projects benefiting 40 national parks and other public lands in 33 states and Washington, D.C. Since 2009, our Buddy Bison School Program and national Kids to Parks Day have engaged 2,000,000 students across the country with our nation’s parks, public lands and waters (ParkTrust.org). Earlier this summer, the First Family visited Yosemite National Park to celebrate Father’s Day and the 100th anniversary of the National Park System in the great outdoors. Standing in a picturesque scene, with the natural legacy of Half-Dome towering several thousand feet overhead, President Obama spoke to a crowd on the importance of our outdoor areas and their unifying qualities. Just three days before the president’s speech, I sat in a briefing on Capitol Hill hosted by the Partnership for the 21st Century Conservation Service Corps (21CSC). The 21CSC is an initiative committed to increasing the number of youth and veterans engaged in protecting, restoring, and enhancing America’s great outdoors through civilian national service. The initiative simultaneously addresses the $11 billion maintenance backlog of our public lands, connects youth to the healing power of nature, and helps veterans reintegrate into society. The amazing thing about the 21CSC is that it unites so many different people and organizations towards a common goal. Throughout the country, there are over 190 member organization of the 21CSC that give local undeserved youth and veterans the opportunity to develop professional skills while engaging in environmental stewardship projects, such as preventing wildfires and constructing hiking trails.These environmental service projects are completed through partnerships between 21CSC organizations and local, state, and federal land and water management agencies. Outside of the 21CSC are dozens of organizations, corporations, and private businesses that support the initiative. These supporters include REI, KEEN Footwear, Sierra Club, The Wilderness Society, and other groups that recognize the significance of the 21CSC for our parks and the outdoor industry. And finally, with the 21CSC Act (S.1993, H.R. 5114) we find bipartisan support; it was introduced in the Senate in August 2015 by Sen. John McCain (R-AZ) and Sen. Michael Bennet (D-CO), and in the House of Representatives in April 2016 by Rep. Martha McSally (R-AZ) and Rep. Seth Moulton (D-MA). The 21CSC was originally started during the Obama administration under Secretary of the Interior Ken Salazar and has grown significantly under Interior Secretary Sally Jewell’s leadership. It serves as a modern expansion on President Franklin Roosevelt’s public work relief program, the Civilian Conservation Corps. The national partnership for the 21CSC is working to reach 100,000 new corps members every year by 2018! The Outdoors Alliance for Kids and the Sierra Club support the initiative to get all kids outdoors learning and active on our public lands. In June, the House Natural Resources Subcommittee on Federal Lands held a legislative hearing on the 21CSC Act, alongside its companion legislation the Public Lands Service Corps Act of 2015. Members of the committee praised these pieces of legislation that aim to provide skills and job opportunities for youth and young veterans. The 190+ member organizations of the Partnership for a 21CSC draw their participants from a diverse pool to develop a new workforce for the future of our lands and waters. Service opportunities are extended to veterans up to the age of 35, especially those returning from Iraq and Afghanistan. Young people, ranging from 15 to 25 year olds, from non-profit organizations to tribal governments, are also given opportunities to serve and develop their professional work skills. To learn more, visit the 21st Century Conservation Service Corps website and join the Sign-On Letter in Support of the 21st Century Conservation Service Corps Act. WASHINGTON, DC – Today, the Outdoors Alliance for Kids (OAK) joined Forest Service Chief Thomas L. Tidwell to announce a new partnership to increase opportunities for children, youth and families to learn about, recreate and explore the natural world on our public lands and waters. The partnership will seek to create new outdoor play and recreation opportunities for millions of young people; provide new or enhanced educational programs for grades K-12; expand service and volunteer programs; provide youth employment and training programs; and implement the National Prevention Strategy for improving health and well-being developed by the National Prevention Council. OAK and the Forest Service will advance shared goals by collaborating to support President Obama’s Every Kid in a Park initiative to connect 4th graders with public lands and waters and the 21st Century Conservation Service Corps to increase volunteer and work opportunities for youth and young veterans stewarding our public lands. The partners will also inventory key youth in the outdoors events and programs, develop a children and youth outdoors federal budget, and convene key partners to evaluate and advance major programs and initiatives related to connecting children and youth with the outdoors. The General Agreement was signed by the Children & Nature Network, The Corps Network, Izaak Walton League of America, National Recreation and Park Association, National Wildlife Federation, REI, Sierra Club, The Wilderness Society and the YMCA of the USA on behalf of the Outdoors Alliance for Kids. In September, the National Park Service, Bureau of Land Management, U.S. Fish and Wildlife Service and the Bureau of Reclamation signed a related agreement. The National Oceanic and Atmospheric Administration is in the process of finalizing a similar agreement as part of a holistic effort led by the Federal Interagency Council on Outdoor Recreation. The mission of the Forest Service is to sustain the health, diversity and productivity of the nation’s forests and grasslands to meet the needs of present and future generations. The agency manages 193 million acres of public land, provides assistance to state and private landowners and maintains the largest forestry research organization in the world. Public lands the Forest Service manages contribute more than $13 billion to the economy each year through visitor spending alone. Those same lands provide 20 percent of the nation’s clean water supply, a value estimated at $7.2 billion per year. The agency also has either a direct or indirect role in stewardship of about 80 percent of the 850 million forested acres within the U.S., of which 100 million acres are urban forests where most Americans live. 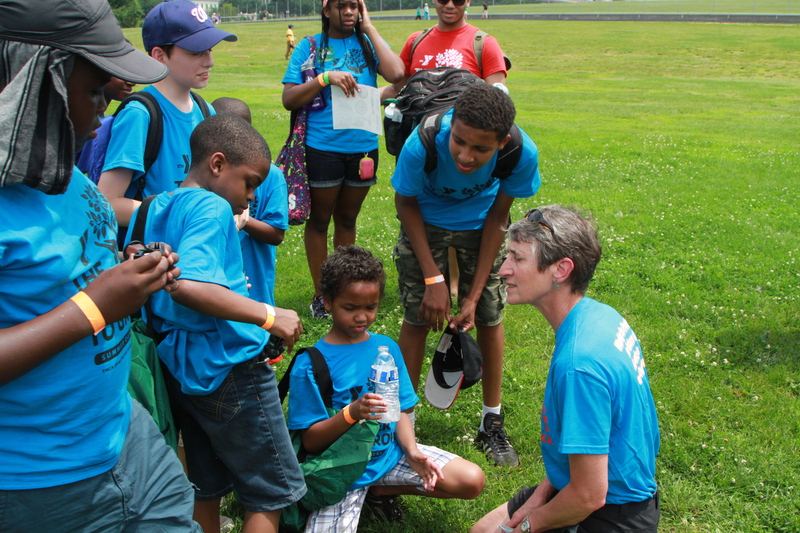 Washington, DC –Today, in New York City Interior Secretary Sally Jewell announced a commitment from American Express that will support a new initiative with YMCA of the USA to connect young people with the outdoors in fifty cities across America. The effort is part of the Secretary’s initiative to connect millions of children and youth with opportunities to play, learn, serve and work in the outdoors. “The Outdoors Alliance for Kids is honored to support this new effort to increase volunteerism among our youth on America’s public lands. Opportunities to engage young people in outdoor service opportunities, like those proposed today, help the next generation of leaders assume responsibility for the stewardship and preservation of America’s great outdoors.